And schedules go to the wayside. Because if our schedules were on target all the time, that would means life isn’t happening. Boring. Reality is – life isn’t boring – no matter what your kids say. I’ll even take hard over boring. With the hard, at least that gives God a chance to shine. That’s what happened this week. Life got hard. God’s been ashinin’. But I won’t give up. We’ll adjust and move on. “Flexibility” they call it. Go, eat your food with gladness, and drink your wine with a joyful heart, for God has already approved what you do. Always be clothed in white, and always anoint your head with oil. Enjoy life with your wife, whom you love, all the days of this meaningless life that God has given you under the sun—all your meaningless days. For this is your lot in life and in your toilsome labor under the sun. Whatever your hand finds to do, do it with all your might, for in the realm of the dead,where you are going, there is neither working nor planning nor knowledge nor wisdom. How do you handle schedule changes? Posted in Uncategorized and tagged homeschool plan, life happens, life is hard, schedules. Bookmark the permalink. After following *most* of my Back to School tips, the night before our first full day of co op (the one day a week we go to school outside of our house), I wanted to be super spiritual for you guys as you begin a new year. I wanted to write an eloquent back to school prayer. You know, one that Moms would read and cry over. and I didn’t really feel like an eloquent prayer. So I found some prayers that touched me. I laughed and cried all at the same time. That Family. Cracks me up. Keeps me real. Makes me cry. Bonnie Gray convicted and (in)couraged me. New clothes for school. Mommy Missional Prayer. Wow. Read it. Prayer from a dad. Thanks Bryan. The verse speaking to me today is one we all know. They have a shepherd. Who won’t leave them. What is the prayer you are praying over your children? 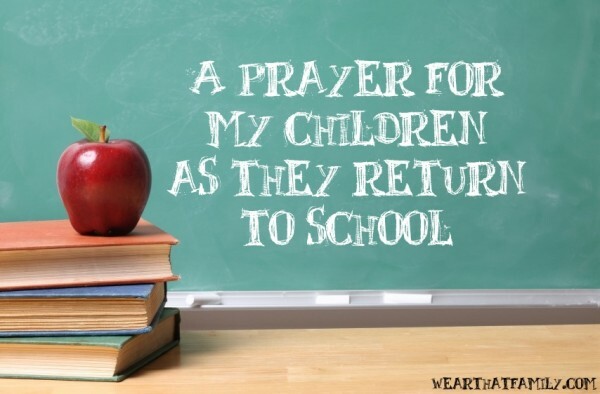 Posted in Uncategorized and tagged Back to school prayer. Bookmark the permalink. There are days I feel alone in my food allergies. When I tell people my number one allergen, most haven’t heard of it. It’s rare. Not many know how to respond. I feel alone. There are days I feel lonely with my food allergies. Social gatherings center around food. It’s a lonely place to be – surrounded by food, with conversation about food, not able to eat any of the food. There are days I miss spur of the moment meeting friends for lunch. As I said – lonely. Even beyond the lonely – the hardest part is feeling different. Those who try to understand – they are the treasures. Next time you come across people with food allergies – encourage them. Even in my loneliness – I lack nothing. I have Him. He is all I need. Posted in Uncategorized and tagged food allergies, lonely, The Lord is all I need. Bookmark the permalink. Summer is over. Camp is just a memory. School starts today. To celebrate summer, we spent time on the lake. My best day fishing! Did I ever tell you fishing saved my marriage? It’s a great story. More on that later. For those who know where I fish – one of these beauties was caught under the bridge, the bigger bass (18 inches!) was dowstream on the second S curve, using a Rapala drift bait. For those who don’t have any idea what I’m talking about – it only matters if you want it to. For everyone – Happy end of summer! Here’s to a great school year! Posted in Uncategorized and tagged end of summer, fishing, Rapala, Summer. Bookmark the permalink. It’s that time again – BACK TO SCHOOL! Some days it feels like Back to Stress! It seems like every day we open our wallets and money just flies out – supplies, clothes, another box of crayons, shoes, fees, supplies, and even more clothes. Did I mention supplies? There’s also the stress and nervousness of new teachers, new friends, and sometimes new schools. Back to school does not need to mean back to stress. These tips will help! Back to Sleep – A few weeks before school starts, get your sleep schedules lined up with what it will be for school. Warning: Your kids will not want a bedtime when they haven’t had one, but this is where moms and dads just have to set a rule and stick to it! That first week of school, you will thank me for this one! Back to Supplies – Even with all the fabulous sales right now on school supplies, it can still add up to a small fortune. Remember, not everything has to be new. Keep supplies year after year and only replace those that really need replacing. When you find something for a great deal, stock up! If possible, go shopping without the kids. When an elementary student sees plain pencils and character pencils, they don’t look at the price, all they know is how cool the fancy ones look. If you do take the kids, this is the perfect time to discuss budgets and sales. A fun idea is to keep all supplies plain, then the morning of school, pull out a present with a few colorful, extra special supplies! It can be as simple as a pencil, eraser, or coupon for a special after school snack. Back to Schedules – Set up schedules the first week of school. If kids know what to expect, they will know how to react. Morning routines, bedtime routines, as well as after school snack/homework/downtime/sports schedules keep things organized and structured. Set a schedule that works for your family, communicate it effectively, then implement it and stick to it! Back to Sadness – I wish I didn’t feel the need to put this in here, but kids encounter serious problems at school. Peer pressure starts younger and younger while bullying continues on many campuses. The stress kids feel with overloaded schedules, not enough sleep, and poor nutrition is very real and overwhelming to their growing bodies. Add the emotional situations they find themselves in everyday and now childhoods are looking more like little adulthoods. Keep the lines of communication open. Discuss situations with your child’s teacher before they become problems. Discuss daily events with your child and let them know you are on their side. Be encouraging and let them know how proud you are how much you love them. Back to Success – As a parent, it is up to YOU to ensure your child is successful. When your child struggles, find the best way to help them. Counteract that area of struggle with something they feel confident in. If you child struggles in reading, work on it daily. Find something they do succeed in and spend just as much time doing that. (Read for 20 minutes then play with legos for 30 minutes!) Focus on an areas they are weak in, they will see failure. If your child knows you believe in them, they will start believing too! All of these are good tips, but my number one tip for back to school – PRAY. Posted in Uncategorized and tagged back to school, build bridges, Parenting. Bookmark the permalink. Yesterday I sent my youngest to camp – Camp for All. She’s been looking forward to this day all year. It’s her camp. Her big thing. Remember when she went last year? She came back changed. I learned lessons too. We are all excited for her to have this opportunity. A few weeks ago we had some interesting conversations about her birthmark. She told me about some new friends she met who didn’t believe her birthmark was real. They thought it was a sticker. One new friend looked everywhere for the stickers. He wanted one. I told her maybe he was onto something. We could market birthmark stickers. Remember how huge the mustache fad was? Hmmmm…. Because she has something different. How does she handle them? When she looks in the mirror, she sees what makes her different and she smiles. Pray with me that she’s a bright light at camp this year. But for those of you who know her, you know she will be. She just is. A bright light. This year, for the talent night, she’s dancing to a song she learned during VBS. Next time you look in the mirror and see something you-just-don’t-like- think of my girl. The girl who doesn’t see something she doesn’t like, although the world would tell her differently. She sees herself. And she smiles. So, Beautiful, next time you look in the mirror, SMILE. And be a bright light – to yourself. Posted in Uncategorized and tagged birthmark, camp, hero. Bookmark the permalink.